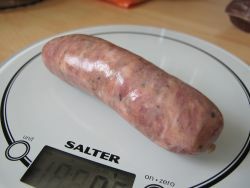 The Churchgate Sausage Company make some wonderfully good sausages, and these Italian Pork ones are up there too!.. Now if you've already tried Churchgate sausages you'll know that they always use top ingredients, mix with a passion and sell an array of fine produce that satisfies the soul! Sorry getting carried away! 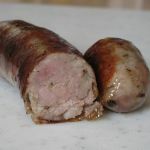 These 80% pork, chunky course Italian sausages have very good chew and taste excellent. Unmistakable oregano flavouring and texture that is not heavy but is still firm with "chunks" of porky bites within. A good foodie experience. They work well in a sausage and mash, and Sunday barbeques with friends have been a hit. When cold thinly sliced in to rounds and eaten with bowl of fettuccine and light tomato sauce has been spot on. Nice lunch! We've tried these pan fried for the review, barbequed, and oven roasted with all methods producing a really good tasting result that you really should try at least once! 110x32mm before cooking, 110x32mm after. 85g before cooking, 77g after. That's a shrinkage of 0% & weight loss of approx 9%.